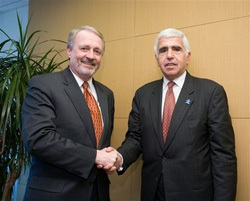 Satellite radio providers XM and Sirius confirmed the rumors Monday, announcing a surprise $13 billion merger of equals, which would keep Sirius CEO Mel Karmazin and XM Chairman Gary Parsons in their respective roles. XM CEO Hugh Panero will not have a role in the new company, which as of yet has not been named. XM and Sirius expect the merger to be completed by the end of 2007, but the companies have major regulatory hurdles to clear first, including permission from antitrust watchdogs and the FCC. Under the terms of the agreement, XM shareholders will receive a fixed exchange ratio of 4.6 shares of SIRIUS common stock for each share of XM they own. XM and SIRIUS shareholders will each own approximately 50 percent of the combined company. News of the merger was first reported by the New York Post, which claimed both sides were meeting in Washington, DC to finalize an agreement. Antitrust concerns way heavy on the negotiations, thus lawyers on both sides were working to address. Between $3 billion and $7 billion could be saved annually with a combined company that would have approximately 12 million subscribers, the companies say. The combination would also merge Sirius’ premier content such as Howard Stern and Martha Stewart with XM’s, which includes Major League Baseball and Oprah Winfrey. “Together, our best-in-class management team and programming content will create unprecedented choice for consumers, while creating long-term value for shareholders of both companies,” remarked Karmazin. “The combined company will be positioned to capitalize on SIRIUS and XM’s complementary distribution and licensing agreements to enhance availability of satellite radios, offer expanded content to subscribers, drive increased advertising revenue and reduce expenses. In a short but impassioned public statement this afternoon, the likes of which has rarely been seen in Washington for decades, FCC Commissioner Robert M. McDowell boldly reiterated his refusal to vote in the current debate over the AT&T/BellSouth merger, citing his former involvement with a legal advocacy group opposed to the merger, and at times quoting the pillars of American ethical jurisprudence. The entire speech was that riveting. As McDowell explained in detail, he had been nominated by President Bush last February to fill a vacancy on the FCC, left when Kevin Martin ascended to the chairman’s position following Michael Powell’s departure. Prior to that time, McDowell served as general counsel to the CompTel trade organization, which not only represents smaller telecom companies, but which has been solidly opposed to AT&T/BellSouth. That merger had already been announced at the time of McDowell’s nomination, so the subject of his stance on the merger became a prime topic during his confirmation hearings before the Senate. Having consulted with the FCC’s Office of General Counsel at the time, he was advised in writing that he should immediately resign his position with CompTel, and for a period of one year disqualify himself from all proceedings in which CompTel, or anyone represented by CompTel, was a party. But Feder’s language in commenting on that portion of US Code showed a certain reticence. The “if’s” in Feder’s language left considerable holes in the legal argument, which McDowell – an accomplished attorney, obviously -drove a truck straight through. Feder’s memo, McDowell pointed out, didn’t even raise the issue of his earlier commitment to disqualify himself from certain proceedings for one year – a commitment which, he made clear, became a promise to the US Senate in exchange for its blessing upon his nomination. Late last week and over the weekend, McDowell sought legal advice from a number of reputable sources, including the Virginia State Bar. None could sway his decision, nor his stance – in fact, they probably reinforced it. Tossing the ball into the court of the four remaining FCC commissioners – if not kicking it there as though it were the fourth quarter with two seconds left from the 50-yard line, and with a two-point deficit – McDowell slowly and distinctly urged them to come to a reasonable compromise. “Because I am an incurable optimist,” he pronounced, citing the spirit of the holiday season, “I am confident that this merger can be resolved with the same speed and unanimity as the SBC/AT&T and Verizon/MCI mergers of last year. At a period of time when Democrats in Washington are stealing the spotlight, one Republican today may have caught the attention of John McCain and Rudy Guiliani. Could Big Telecom Mergers Be Undone? The once-certain merger process between the largest US telephone company, AT&T Inc., and former “baby Bell” and regional telephone carrier BellSouth, could perhaps be delayed further on account of a curious federal district judge. His hearings into why the AT&T/SBC and Verizon/MCI mergers were expedited by the Justice Dept. 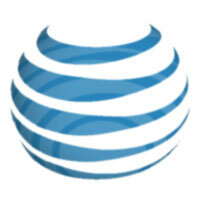 could raise skepticism about the viability of AT&T/BellSouth. In a filing in US District Court yesterday, covered brilliantly by Anne Broache of CNET, attorneys for the Justice Dept. defended themselves against allegations that they slacked off on their reviews of the legality and competitive implications of the Verizon/MCI and AT&T/SBC mergers of 2005. The filing apparently devoted most of its space to denouncing the allegations of citizens’ rights groups whose opinions District Judge Emmet Sullivan had extended the proceedings in order to receive. However, it appears to have sidestepped a key issue which Sullivan apparently hasn’t missed, and which may become another sticking point in the merger proceedings between AT&T and BellSouth. The amendment was literally a single word. The value of this word could very well be over $80 billion USD as the AT&T/BellSouth merger resumes the scrutiny it nearly skirted. As the law was originally phrased, “Before entering any consent judgment proposed by the United States under this section, the court may determine that the entry of such judgment is in the public interest.” This means, after the Justice Dept. passes what’s called a consent decree – an advisory stating the conditions under which the DOJ would approve the merger, assuming it is approved – the court has the right to review that decree to make certain the DOJ is acting in the public interest. The 2004 amendment replaced “may” in the above sentence with “shall,” meaning the courts must review the consent decree rather than wave it on, sight unseen. Taking the amendment quite literally, Judge Sullivan has continued his extensive review of the consent decrees in the AT&T/SBC and Verizon/MCI mergers, declaring as recently as November 30 that Verizon/MCI has not actually been validated, and is thus still pending. The judge’s extended review, which has been going on since last July, is being scrutinized for possibly having triggered the Justice Dept. to find a way to avoid a similar situation with AT&T/BellSouth. Though the amended Tunney Act states the court shall review the consent decree for a merger, it presumes that one exists. A consent decree implies that the DOJ lays out conditions for the merger to proceed. Last October, the DOJ issued a press release stating it had approved the AT&T/BellSouth merger, and that it could go forward. In so doing, it took the unprecedented step of not issuing any consent decree at all, giving Judge Sullivan – who would have inevitably reviewed it – nothing to review. That fact has caught the attention of incoming House Energy and Commerce Committee Chairman Rep. John Dingell (D – Mich.), who promised last month, almost immediately following the sweeping Democratic victories in the last mid-term election, to open up hearings into AT&T/BellSouth. Conceivably, those hearings could now be broadened to encompass the whole proverbial can of worms, examining the process by which the DOJ’s approval of the last two telecom mergers was apparently accelerated. This news comes as the Justice Dept. seeks to overhaul its own processes, in the interest of accelerating merger reviews even further. In its latest draft amendments to the 2001 Merger Review Process Initiative, the DOJ proposes changing its order of business in order to quickly set aside affairs that it would deem unimportant or unworthy of investigation, tapering the initial fact-finding period following the merger parties’ so-called Hart-Scott-Rodino notification to the SEC, to as little as two weeks. The DOJ is free to amend its own practices, probably without judicial review; but if congressional hearings into antitrust matters convene next month, and if their purview is extended to cover telecom mergers that even stockholders may have thought already happened, matters such as why the DOJ is keen on expediting the triage process for public interest matters, may take the spotlight.